From 1921 onwards the TNL was increasingly inspired by the practices of the prestigious Parisian STCRP (Societe des Transports en Commune de la Region Parisienne) in choosing its rolling stock and operating methods. After several years of rapprochement, the Nice network was definitively integrated into the Parisian group in 1927. The TNL’s head office was transferred to 4 rue Las Cases in Paris, in the premises that previously housed the offices of the Compagnie Zénérale des Omnibus (CGO) and the Compagnie générale parisienne de Tramways (CGPT). The new Board of Directors was chaired by Mr. André Mariage, who was in charge of the STCRP, from which most of the other members came: Mr. Georges Bouton, administrator of l’Est-Parisien; Julien Péridier, Director of Studies and Technical Control of the STCRP; Lieutenant Colonel Maurice Binder, administrator of the CGO; Ferdinand Maillot. Mr. Louis Régnier, head of the STCRP’s accounting department, was auditor. Mr. Jacques Schopfer, formerly a rolling stock and traction engineer, was appointed Director of the TNL. He was replaced a few years later by Jean Baudouin, Chief Operating Officer, assisted by Alfred Gallais, Chief Administrative and Accounting Officer; Bernard Kergall, Chief Technical Officer; Emile Rigal, Chief Rolling Stock and Traction Officer; René Vinet, Chief Electrical and Track Officer. The TNL was now tied to the dictats and intentions of the STCRP, for better or for worse! At the end of the 1920s the tramway was no longer seen as a fast, safe and efficient means of transport, but rather as an obstacle to traffic and an obstacle to progress, the latter being represented by the car. After initially supplementing their existing network with buses, the public transport operators in both Nice and Paris tried to convert most of the existing lines to buses. They were encouraged by public opinion, the press, tourist information offices, car clubs and many elected officials, both in the Alpes-Maritimes General Council and in the city of Nice. It is not surprising that the new mayor elected in December 1928, Jean Médecin, made the removal of the tracks in Place Masséna and on Avenue de la Victoire one of his election promises. 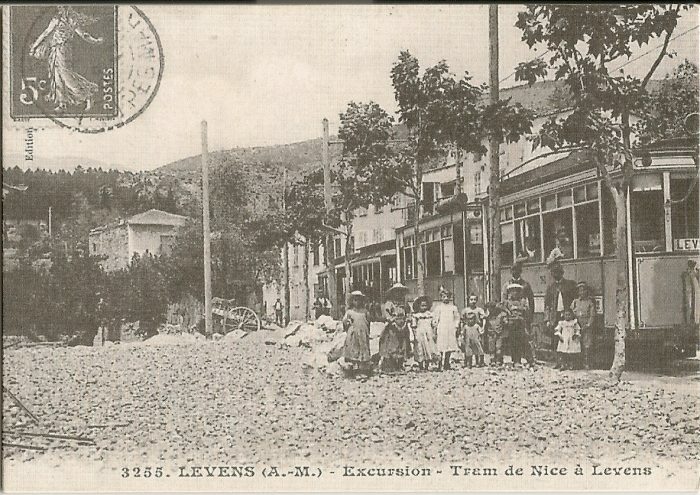 While these debates were taking place in the city of Nice, work to extend the ‘departmental’ lines at Levens and L’Escarène was suspended and the General Council considered using the infrastructure built to establish roads there. 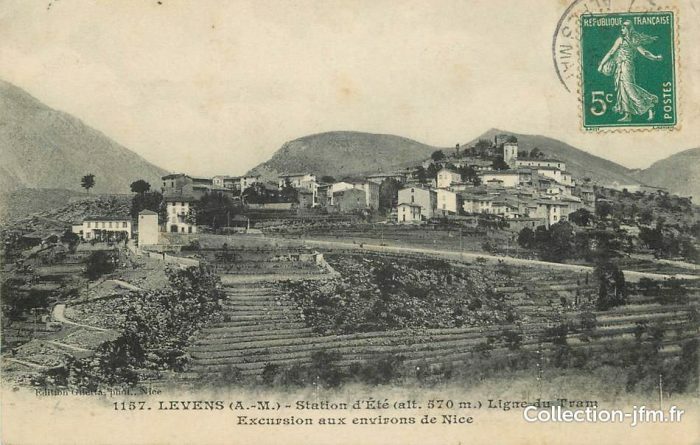 In the autumn of 1926, the valleys behind Nice were hit by torrential rains. On the TAM network, the lines in the valleys of l’Estéron, Haut-Var, Tinée and especially the Vésubie were broken. A massive landslide engulfed the village of Roquebillière and about twenty of its inhabitants died. Although closer to the coast, the TNL lines of the Paillon basin were not spared by the conditions. On 18th November, the flooded river damaged the permanent way on the La Grave-de-Peilie branch, but tram traffic was able to resume on a temporary detour on 15th December. Along the main road, a large landslide blocked the stretch between Contes and Bendéjun. The road was rebuilt in January 1927, but despite several reminders, the TNL did not carry out any repairs on the track and the overhead line, taking advantage of this case of force majeure to stop the operation of the tramway between Contes and Bendejun. This section of the tramway experienced disruption due to landslides and was also from the outset little used by passengers. Faced with a fait accompli, the General Council accepted this closure. The forthcoming expiry of the agreements gave the TNL the opportunity to review the extremely complex administrative control of its network, which fell under five different legal jurisdictions. The urban lines in Nice were offered to the State by the municipality. The State passed responsibility to the TNL. However, one line, that to Cimiez, was granted directly to the TNL by the city authorities. He lines to Cagnes, Contes and Menton which formed the coastal network alongside the tramways in the port were within the gift of the State and were granted to the TNL to run, with the exception of one line which crossed the principality of Monaco which was innthengift of that sovereign state. In addition, the lines to Levens, Cap-d’Antibes, Cap-Ferat and Bendejun, La Grave and Sospel were conceded by the State to the Transports des Alpes-Maritimes and in turn passed to the TNL. On 1st December 1927, a new agreement replaced the city of Nice with the State as the licensing authority for the urban network and ratified the creation of new bus lines. This agreement was not approved by a ministerial decree until 5th March 1929. At the same time, negotiations were undertaken in the spring of 1928 with the General Council to group the coastal and departmental lines into a single network where tramways would only be maintained where absolutely necessary, particularly when the freight service so required; otherwise, tramway routes would be replaced by bus services. The result was a decision to keep only the lines to Contes, La Grave and Sospel – all others would be replaced by bus services. Passenger numbers were dropping rapidly and there were very few signs of hope. On 30th October 1928 the PLM inaugurated its international service Nice-Breil-Cuneo. The construction work for this line had been a major part of the freight traffic on both the La Grave and Sospel lines for years. The new line provided a much faster link to the communities served originally by the trams. In Sospel alone, the average number of tram passengers fell by 51% and the tonnage of goods by 58%! The year 1929 marked the beginning of the end for the departmental tramways. After the TAM lines to Estéron, Vésubie, Haut-Var, Grasse and Bar closed in April and May, the TNL network closures began in the autumn. Growing car traffic made the closure of the coastal tramways a priority. With the development of car traffic, the elimination of the tramway was considered a priority on coastal arteries. The first line hit by the road-building programme was Nice – Antibes, the Bridges and Roads Department wanted to widen the RN7 onto the shoulder occupied by the tramway. Tram traffic ceased on 29th October 1929 between St. Laurent-du-Var and Antibes. The service was replaced by buses -two new coach lines. As the quantity of road vehicles available was still insufficient, the Antibes-Gare – Cap-d’Antibes shuttle remained temporarily provided in a mixed form by tramway and by a new coach line. The few power cars kept in Antibes for this service were isolated from the rest of the network, sheltered and briefly maintained in the shed near the PLM station. After seven months of this arrangement that service closed on 1st June 1930. The coastal line was gradually converted to buses. 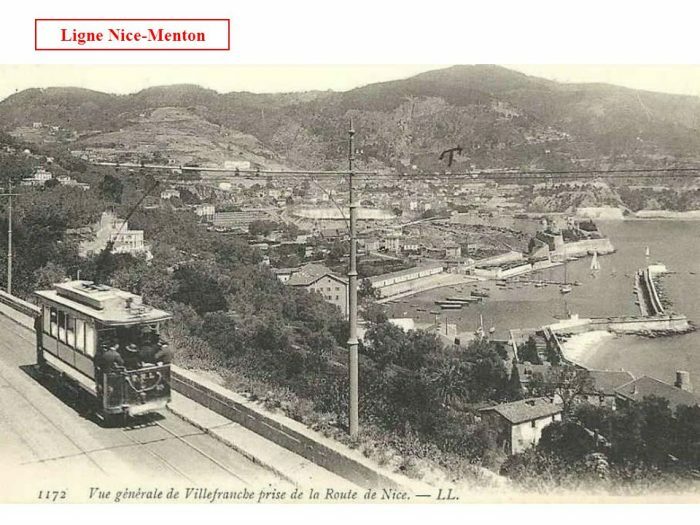 On 9th March 1931, the tramway was closed between Villefranche, Pont-St. Jean, St. Jean-Cap-Ferrat, replaced by a road service. On 18th June the length between Nice and Villefranche gave way to a suburban bus service. Ligne Nice-Villefranche Two lines which took so much effort to build and operate were then closed. 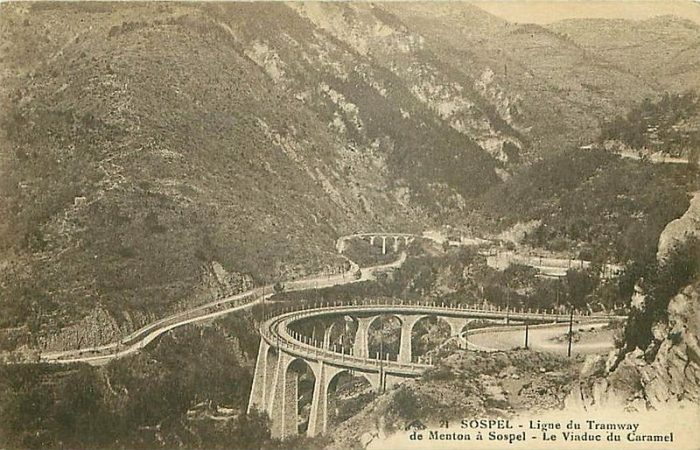 The first was the Menton to Sospel line. The traffic on the Menton to Sospel line collapsed after the opening of the Nice to Cuneo railway line. It was closed and replaced by a bus service. Only a short suburban section in the lower Careï valley was temporarily preserved. The route had only been in service for 19 years. The bus fleet was not yet up to full strength and it took some months to completely close the tramways around Menton. On 2nd October seven motor trams which were no longer needed were sent to Nice. The last vestige of the trams in this area were abandoned in 1933. For a short period of transition, the TNL organized a bus route between Beausoleil and La Turbie to replace the rack railway whose operation had just been suspended following a fatal accident in March 1932. The service operated from 25th April to 31st July 1932 before is was passed to a local company. In less than three and a half years, large parts of the TNL tram network had been closed with the full support of various statutory bodies and the local press. Thesevcactions were approved by decree on 20th June 1933, which ordered the downgrading of the closed lines: St. Laurent-du-Var – Antibes, Antibes – Cap-d’Antibes, St. André – Levens, Contes – Bendéjun, Pont- St. Jean – St. Jean-Cap-Ferrat, Villefranche – Monaco, Monte-Carlo – Menton, Menton – Sospel and the Menton station branch (closed since the war), as well as the two unfinished tramway sections: Levens-Station – Levens-Village and La Pointe-de-Contes – L’Escarène. Jose Banaudo; Nice au fil due Tram Volume 1: l’Histoire; Les Editions de Cabri, 2004.
https://fr.m.wikipedia.org/wiki/Tramway_de_Nice_et_du_Littoral, accessed on 11th April 2019.
https://slideplayer.fr/slide/3703631, accessed on 11th April 2019.
https://fr.m.wikipedia.org/wiki/Tramway_de_Menton_à_Sospel, accessed on 11th April 2019.
https://www.geneanet.org/cartes-postales/search/?country=FRA&go=1&page=1&place=Levens&region=PCA&size=40&subregion=F06&zonegeo=Alpes-Maritimes%2C+France, accessed on 11th April 2019.
https://collection-jfm.fr/p/cpa-france-06-levens-station-d-ete-ligne-du-tram-excursion-aux-environs-de-nice-12154, accessed on 11th April 2019.
http://www.barrysbest.net/Weathertopia/MonteCarloMonaco.html#.XK9Ntpgo-9c, accessed on 11th April 2019.
https://www.akpool.co.uk/postcards/27613626-postcard-monaco-tram-route-de-nice-a-monaco, access on 11th April 2019.